Andrea Chrisjohn, a leader at the Toronto Council Fire Native Cultural Centre, hopes that a new Indigenous sculpture being installed at Nathan Phillips Square prompts reflection among passersby. A sculpture of a snapping turtle will soon sit in Nathan Phillips Square as a tribute to the city's Indigenous population. 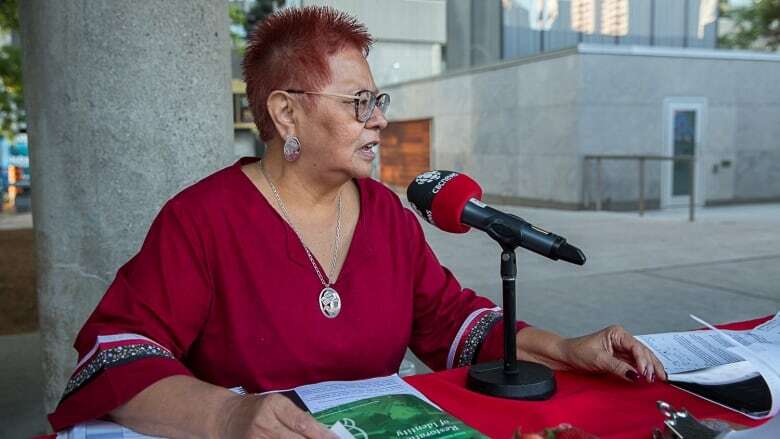 Andrea Chrisjohn, board designate at the Toronto Council Fire Native Cultural Centre, told Matt Galloway on CBC Radio's Metro Morning that she hopes the new sculpture will prompt people passing by to reflect. "The turtle is revered by all of our nations as the base of being here on this earth," she said. The sculpture will feature a snapping turtle climbing a boulder, symbolizing triumph over the smothering of Indigenous identity. "The restoration of identity was the closest that we could come to having people understand from all societies the displacement of our people," she said, explaining that the statue represents the survivors of residential schools. Chrisjohn said the snapping turtle is part of the origin story for many First Nations. "We refer to Mother Earth as Turtle Island. They provide sustenance, opportunity and hold each one of us up," she said. The turtle's shell will serve as a lunar calendar representing the 13 moons which, according to Chrisjohn, "allows us to plan seasons, when to have children, plan ceremonies or harvest." The location of the sculpture is deliberate, said Chrisjohn. She wants people entering city hall — especially people involved in city government — to see it and think about its meaning. The unveiling of the sculpture is set for October 2018.